Bugs! Bugs are aliens that creep into a programmer’s code at night when no one is watching and alter the state of a working code. These aliens have only one mission - to frustrate the life of a programmer. How does a programmer kill a bug before he dies of frustration? Yeah, you got it right! By debugging and removing the buggy code. But why would a programmer go into a debugging war without the right tools? If a programmer is going to debug he better do it the right way, using the right tools. In smart contract development, like traditional centralised software development, bugs creep into the smart contract developer’s code during the development life cycle of the smart contract. While there are ‘Etherillion’ reasons why smart contracts could be buggy, one thing remains important, all bugs must be removed before the smart contract is deployed on the mainnet, or else, we risk losing funds and ultimately, the credibility of the smart contract. There are several frameworks for developing smart contracts in solidity. In this article, the focus is on the Truffle Framework. Truffle aims to make a developer’s life easier by providing development environment, testing framework, and debugging tools for smart contract development. Smart contract bugs can be hard to find, and error messages can be very obscure. When building smart contracts using Truffle, the Truffle Debugger comes in very handy when it is time to debug a contract. This is because when debugging a smart contract, you’re not running the code in real time; instead you are stepping into the historical execution of that transaction on the blockchain, and mapping that execution onto its associated code. This process of debugging can be tedious to reason about traditionally, and this is where the Truffle Debugger really helps - by allowing us to debug any transactions as long as we have the code and the artifacts of the transaction. Let’s talk briefly about the Truffle Debugger and then take an example to show how this tool can be used. Debugging is a cyclic activity involving execution testing and code correction. This command evaluates the instructions evaluated by the virtual machine relative to the contract until the next line in the current smart contract file, skipping the functions referenced at the current execution point(if any). This command steps into the function called at the current execution point. This command will have the debugger step out of the current function, to the next line executed right after it. This command steps to the next logical statement or expression in the current function called. This command steps through each individual instruction evaluated by the virtual machine. Thus far, we have talked about debugging, and the Truffle Debugger, let’s have an example to really drive this home. The repository for this article can be found here, just in case you want to follow through the debugging process without coding the smart contract. Enter into the folder and create a bare the truffle project. The state variables: The state variables owner and skuCount store the address of the owner and the count of food items added to the FoodCart respectively. The mapping foodItems maps skus to food items. The enum: The State enum is a user-defined data type that holds the state of the food items on the cart. The types listed in the enum are explicitly convertible to and from integers, i.e (ForSale = 0, Sold = 1). The struct: The struct FoodItem is a user-defined type which holds the properties of a food item. These properties can be accessed using a dot notation on the struct. The function modifiers: The modifiers doesFoodItemExist, isFoodItemForSale, and hasBuyerPaidEnough are functions that automatically check a condition prior to executing the function on which they are applied to. The role of the function modifiers used in this smart contract are obvious from their names. The functions: The functions addFoodItem, buyFoodItem and fetchFoodItem adds food items to the contract, allows a food item to be bought and allows the details of food item to be viewed respectively. The constructor function initializes the owner state variable with the address that the contract is deployed on. The anonymous payable function allows ether to the sent to this contract. Let’s deploy the smart contract on the private network. 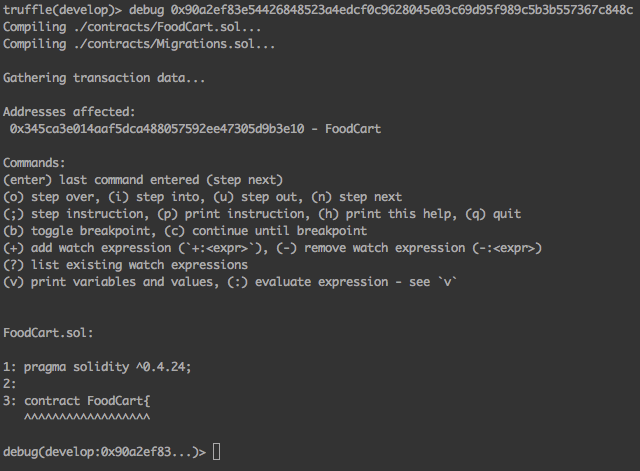 In your IDE, create a new file called 2_foodcart_migration.js in the migrations folder. Open this file after creating it and add this code: This piece of code will enable the framework to deploy our FoodCart.sol contract to the private blockchain. 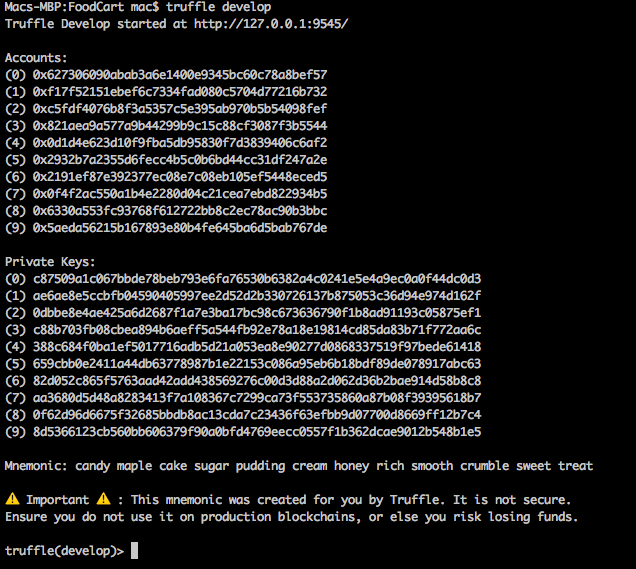 The image above shows that a development blockchain has been started on port 9545, test accounts have also been created for use, and the terminal is navigated to a new prompt truffle(develop)>. In the truffle(develop)> prompt, type the compile command to compile the contract. The result of the compilation is stored in the build folder of your project directory. Finally, let’s migrate the compiled contract to the blockchain for deployment. At the terminal, type the migrate command to migrate the contract to the development blockchain that has been started for us. Let’s interact with our smart contract and get a feel of how it works. We will be adding food items to the food cart, checking the details of food items added to the cart, and also buy food items off the cart with Ether from one of the accounts created for us when we started the development blockchain. Still in the truffle(develop)> prompt, create a foodCart variable and store the instance of the deployed contract in it. In the short code snippet above, we access the deployed FoodCart contract via the web3 .deployed method which returns a promise interface and we pass a function which stores the instance of the deployed contract in the foodCart variable. With the instance of the contract stored in the foodCart variable, we can access the functions of the contract through the foodCart variable. Now that we have about 3 food items on the the food cart, let’s buy some food items off the cart. Before we can buy a food item, we need to specify what address we will be using to make our purchase, because it is from this address that we can get the funds in ether to buy food items. Recall that when we started our private blockchain, 10 test accounts were created for us and each of these accounts was credited with 100 ether which we can use to buy anything we want, we are rich 🤑🤑. Let’s create a variable to store one of these addresses or accounts so that we can easily call it anytime we want. Since we have an account 0xf17f52151ebef6c7334fad080c5704d77216b732 (yours will be different), we can add a function to buy food items off the food cart at our truffle(develop)> prompt. The buyFoodItemFromCart allows us to buy food items off the cart by calling the function with the itemSku and amount of the item. The amount to be paid for the item is taken from the account that was stored in our buyerAddress variable. Let’s buy Fried Rice off the food cart. From our previous transactions, we recall that the sku for Fried Rice is 0 and it’s price is 10 wei. So at the truffle(develop)> prompt, we call the buyFoodItemFromCart function with these values: From the output, we see that the state of the item is Sold and the foodItemExist is now false, indicating that this item is no longer for sale. If you have made it thus far, you deserve a Noble prize for Tenacity 🎖, enjoy the fame it brings. So far, we have seen how the contract should behave. To be able to use the Truffle Debugger feature, we would introduce some errors while interacting with the contract and then use the debugger to debug the error and get it fixed. To debug a transaction, we need to have the hash of the transaction and then run command debug [transaction hash] at the truffle(develop)> prompt followed by any of the debugger commands until we find out where the transaction failed. Before we start these transactions, we need to start the truffle develop logger in another terminal, but still in the sample project. 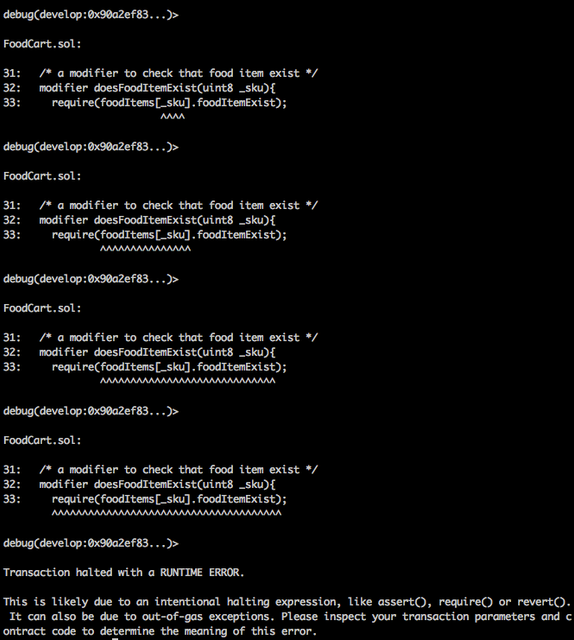 Open a new terminal, navigate to the FoodCart project and run this command truffle develop --log. The logger connects to an existing session at the port specified, listens for transaction events, and logs the output of the transaction which should include items like transaction hash, block number, etc. Let’s go ahead and make the life of our contract a living hell 👹. From our previous transaction where we added food items to cart, we had skus 0, 1, 2 respectively for the 3 food items. We will try to use the sku 6 to buy a food item that does not exist. Trying to buy the item as shown in the command above produces the error UnhandledPromiseRejectionWarning: Error: VM Exception while processing transaction: revert ... which does not really tell us what or where the problem came from. Now this can be real headache when there’s no debugger. I have spent many hours trying to debug a smart contract without using the debugger and it can drain the last blood out of one. Let’s have a look at log output and see what we have there. From the image, we see that when the debug command is run, the debugger compiles the contracts, gathers transaction data, fetches the address that was affected and the contract that was deployed at that address, and shows a list of debugger commands that we can use to interact with the debugger. The most interactive command to use at the debugger is the step next command which steps through all the instructions executed during a transaction one at a time. The step next command is executed by pressing enter or n, at the keyboard of course. At last step on line 33 in the image above, we see that the transaction halted because the transaction failed the required condition to be able to buy a food item from the cart. The item that we wanted to buy does not exist. The require function throws a state-reverting exception when a condition to which it is applied to fails. A state-reverting exception reverts or undo all changes made to the state in the current call (and all its sub-calls) and also flag an error to the caller. We have been able to successfully debug this code using the Truffle Debugger, and it has been pretty amazing. In this transaction, we will try to buy a food item with less amount than the price of the food item. In ‘step 3: Interacting with the smart contract’, we added 3 food items. Let’s try to buy ‘Chicken Pepper Soup’ with sku 1 and price 10 wei. 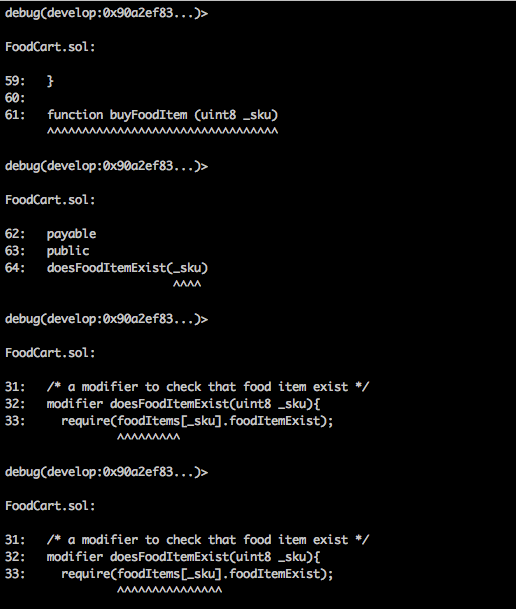 At the truffle(develop)> prompt, call the buyFoodItem function to buy a food item with less amount than the price. Expectedly, this transaction fails, giving a cryptic error message as usual. To debug this transaction, we go to our log terminal and copy the hash of the transaction. On my machine the transaction hash is 0x5dc12d3ac524cfd1e3c0ea9265a155149ff16fcb18f904016a87e83cca5f9a30. With this transaction hash, we shall debug the transaction and figure out where the transaction halted. In the image above, we see that at line 44, the modifier hasBuyerPaidEnough is called before the buyFoodItemFromCart function is executed, and at line 45, the modifier requires that value sent by the buyer is greater than or equal to the price of the item. However, we know that we flouted this condition hence, it halted our transaction. So if we send the right amount, we will surely buy the food item we need. In conclusion, the importance of a debugger while building smart contracts cannot be overemphasized. 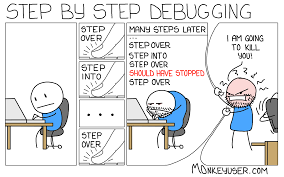 With a debugger, we can test our modifiers to ensure that our contract behaves appropriately, we can ensure that our contracts are secure by sending malicious transactions to our contract to see how it will behave and properly debug the transaction to see the instructions that have been executed up until the transaction halted, if it did. Most importantly, we can save our most valuable asset which is time, by using a debugger whenever we face issues with our smart contracts, instead of fumbling around with our code.